Because these three summer-time adventures feature Yellowstone National Park, I’m sure you can imagine the number of questions our sales team receives on what the differences are between the three trips. While your adventure travel consultant can go into much more detail, below is at least a start in differentiating between these three Big Sky Country adventures. Let’s start with figuring out which trip begins where. Our Yellowstone and Montana Adventure itineraries follow a big loop, beginning and ending in beautiful Bozeman, MT – a mountainous college town with a western attitude. Both of these itineraries follow nearly the same route – heading south on Highway 191 through the Gallatin Canyon towards the town of Big Sky, entering Yellowstone through the West Entrance (West Yellowstone), exiting the Park through the North Entrance (Gardiner) and heading back to Bozeman through aptly named Paradise Valley. Our Yellowstone trip (as you can imagine) spends more time inside Yellowstone National Park, while our Montana trip spends more time outside the park in Gallatin Canyon and Paradise Valley. Our Wyoming Adults Only Vacation begins in Jackson, WY – home of the classic cowboy. Upon pick-up, you’ll spend half a day exploring Grand Teton National Park (yes, you get to visit two national parks on this itinerary!) before heading north towards the South Entrance of Yellowstone National Park. If you picture the road system of Yellowstone as a figure-8 loop, we’ll spend the next several days touring around the lower loop before exiting out of the South Entrance once again, driving south towards the Tetons. Upon arriving in Jackson Hole, you’ll spend the last half of your trip exploring Grand Teton National Park and the “playground”surrounding the town of Jackson. * Note: Lodging has been simplified in this chart. For example, at Old Faithful, we may stay in the Old Faithful Inn or the Old Faithful Snow Lodge. At Mammoth Hot Springs, you would likely stay in the cabins and not the main hotel, etc. We usually have our guests stay in the cabins located just behind Mammoth Hot Springs Hotel. The entire Mammoth Hotel complex (est. 1936) is within easy walking distance to the area’s namesake: Mammoth Hot Springs, a colorful collection of travertine terraces, lighting up the hillside in oranges, yellows and bright whites. The cabins feature two double occupancy rooms side by side with a shared porch. Our Yellowstone guides pull out all the stops with a BBQ and games for the kids on the cabins’ open lawns. The 320 Guest Ranch (est. 1898) sits back off of Highway 191 right along the Gallatin River, featuring quaint log cabins with shared porches and views of horse pastures right out your front door. A true horse ranch, you can catch the running of the horses every morning and evening as the ranch’s cowboys round up the herd for either a night in the pasture or a day in the corrals. At a sprawling 320 acres, the ranch features a pond to try out flyfishing (beginners welcome), a hiking trail that begins onsite, and a pig roast with live music on Monday nights that everyone in the area (including our guests) attends for a rip-roarin’ good time! One of our favorites, Chico Hot Springs Resort (est. 1900) is a unique collection of buildings featuring a main hotel, several different lodges and a few cabins. Usually our guests stay in either the Fisherman’s Lodge or the Lower Lodge both unique in their own ways. With many different amenities on site, we find our guests (and guides) truly love this resort in the middle of no-man’s land (check-out Pray, MT and you’ll see what we’re talking about!) It’s tough to choose our favorite amenity between the best dining room in Montana, two large hot spring pools (one kept at 96°F and one at 103°F), classic cowboy bar, soothing day spa and beautiful walk-through garden and greenhouse! In our mind, Jackson Lake Lodge wins the prize for “Best Views from an Accommodation. Looking out from the main lodge’s back deck, you’ll first spot towering, square-topped Mount Moran of the Teton Range starring you back in the face. Next you’ll notice miles upon miles of willow-dotted moose habitat (bring a pair of binoculars!) Last of all, you’ll want to take in the view from “the backyard” either from the Mural Room eating a delicious meal or at the bar snacking on aperitifs and sipping on a Huckleberry Margarita, taking in a gorgeous Tetons sunset. The Rustic Inn sits right on the outer edge of the town of Jackson, on twelve acres along winding Flat Creek. While this accommodation is anything but rustic, it features luxury log cabins, countless amenities, a revitalizing spa, and an outdoor heated swimming pool. This property is adjacent to the National Elk Refuge (and the bike path leading into Grand Teton National Park) and just a few short blocks walk to the lively town square. It’s the perfect place to end a vacation in the Tetons. All three of our Yellowstone, Montana and Wyoming itineraries feature some sort of hiking. Out of the three, our Montana itinerary offers the most difficult hike – a 6 mile round trip trek to Beehive Basin with 750 feet elevation gain. Most days, a hike will range from a quick and easy boardwalk loop to a moderate 3 miles with some elevation gain and loss. Often, your group will embark on several hikes in one day, showcasing completely different areas and natural features. We offer a variety of out-and-back, loops, and point-to-point treks. (Note that our adult departures may offer more difficult hikes, depending on group abilities). 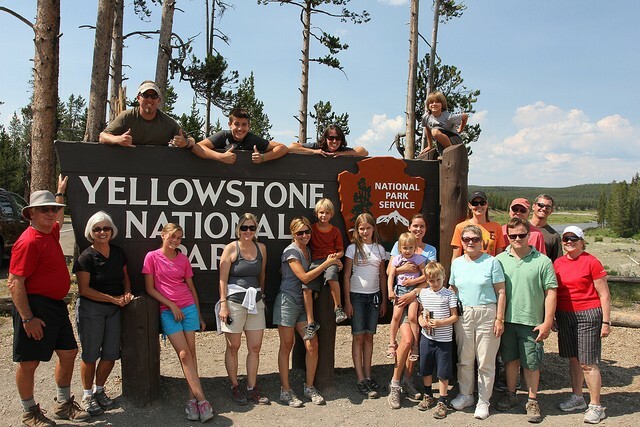 Only our Montana and Wyoming (ages 7 and older) itineraries feature biking while Yellowstone (ages 5 and older) does not. We consider biking in Yellowstone National Park on the winding, shoulderless roadways to be very dangerous. Throw a bunch of brand new RV drivers into the mix and it would seem downright careless to put bikers on the roads of Yellowstone! While there are several off-road biking areas in Yellowstone, we feature one of our favorites on our Wyoming and Montana itineraries: a 7 mile long gravel path that winds its way behind Midway Geyser Basin. We offer one other bike ride on our Montana program: a short and sweet, mostly downhill ride from Big Sky down to Gallatin Canyon (a perfect starter ride for families). We do more biking on our Wyoming trip with one ride in Yellowstone and three rides in the Tetons either on little-traveled roadways or bike paths. Both our Yellowstone and Montana itineraries feature the same horseback ride in Paradise Valley at Flying Diamond Ranch (there is no riding on our Wyoming trip). We’ve been working with the same ranch for over 20 years and our fourth generation ranchers will share with you many stories of the livelihood of a rancher from running an elk hunting camp in the fall to birthing cattle in the spring and everything in between. This ride is perfect for a beginner rider, although we do caution that this is no pony ring ride at the county fair. You’ll be walking the horses uphill for about an hour to take in views of Paradise Valley, Gallatin National Forest and the Davis Family’s ranch land. After a short break to stretch your legs at the top, you’ll head back down a different way to see the valley and your surroundings from a new angle. It truly doesn’t get much better than this classic Montana ride! All three of our itineraries offer rafting on relatively easy-going Class II and III FUN rivers. Yellowstone and Montana both feature a raft trip down an 8 mile stretch of the famous Yellowstone River. This is the perfect raft trip for families or beginner rafters and will definitely get you wet! With opportunities to swim in a few spots, you can learn for yourself just how cold a Montana snowmelt river really is (don’t worry, you can always wear a wetsuit ¦although on a hot day, you won’t need one!) Our Wyoming itinerary features an 8 mile trip down the Snake River on smaller rafts, guaranteeing you’ll get wet no matter where you sit! On both the Yellowstone and the Snake, you’ll use inflatable, self-bailing rafts that come with guides who have been trained in river safety techniques. Nothing screams western entertainment quite like a rodeo in Jackson, WY. If you’ve never been to a wild and wooly rodeo before, you’re in for a real treat. While the Jackson Hole Rodeo is a bit cheesy, it’s fun for both locals and tourists alike and truly shows you the real deal when it comes to ridin’ a buckin’ bronco, barrel racin’ or cattle ropin’. Grab a beverage, some popcorn and a cowboy hat, get your cheer on and start rootin’ for your favorite cowboy (or clown). In no time, you’ll find yourself hootin’ and hollerin’ with the rest of the crowd! While only our Yellowstone itinerary features an entire early morning (yes, you’ll be up at 4:00 AM) dedicated to wildlife viewing, there’s a high chance on any of these three itineraries that you’ll spot grizzly or black bears, wolves, coyotes, foxes, deer, elk, pronghorn, moose, bison, bald eagles, osprey, and much more! Both Yellowstone and Grand Teton National Parks (and the entire 20 million acre Greater Yellowstone Ecosystem!) are meccas for wildlife watching. Your best chances to spot your favorite animals are at dawn and dusk when the wildlife are most active, but there’s also a lot of luck involved and if you keep a watchful eye out at all times (when pedaling your bike, hiking or riding in the van) there’s a good chance you’ll spot some pretty neat animals! There are opportunities to swim, soak or even polar bear plunge into cold mountain lakes on all three of these itineraries. Our Yellowstone and Montana itineraries both end on a high note at Chico Hot Springs Resort, which features two large pools, ideal for playing and soaking. Our Wyoming itinerary features outdoor heated pools at both Jackson Lake Lodge and Rustic Inn -perfect for the kiddos. On the Yellowstone trip, a highlight is soaking in the Boiling River, a short stretch of the Gardner River in which hot water from Mammoth Hot Springs pours in from the banks. Try to find a spot where it’s not too hot and it’s not too cold – it’s challenging but fun! Rafting on the Snake and Yellowstone Rivers both offer swimming opportunities raft-side. If you’re really brave, jump into the frigid waters of Beehive Lake (Montana), Lake Yellowstone (Yellowstone) or Jackson Lake (Wyoming)! If you’ve read through this entire blog, chances are you’re now an expert on the differences between our Yellowstone, Montana and Yellowstone-Tetons itineraries (congratulations!) While each of these itineraries feature their own special routes, lodging, restaurants and activities, you’ll find the perfect trip for your family with the help of your Austin Adventures adventure travel consultant. Don’t forget that if you don’t find the perfect lodging or activities, it’s easy to customize a trip or add on activities like ziplining or flyfishing right in your host city. Just call the experts, we’ll help you create your perfect adventure vacation!